It is not often you will be able to watch a 90 minute length biopic drama about your football team. As a Stoke City Football Club fan this moment came when watching ‘Marvellous’ on BBC Two. For those who have heard about Neil ‘Nello’ Baldwin but not got round to watching the programme, it was basically a true story reflecting on how the ex Stoke City kit man overcame his learning difficulties by enjoying making people happy.A genuine, down to earth attitude to life rarely seen nowadays. 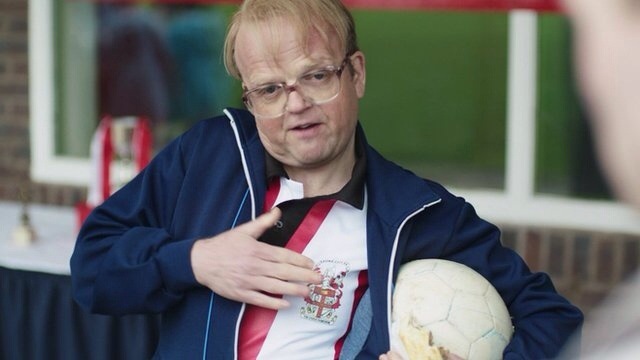 Born and bred in Stoke-on-Trent Neil Baldwin (played by Toby Jones) grew up with a difficult childhood but there were certain elements of his life that made him happy. He loved performing and being part of the circus (known by his stage name ‘Nello’ the clown). However, the reality of the situation was he had to earn a living. Unfortunately, it was not in the arena that he was just known as the clown. With the job at the circus looking fairly secure, we then see him get underpaid after his performance. The next morning the big top disappeared and that was the end of the circus for Neil. As Neil began his search for employment each stage was preceded by a subtitle, Neil’s guide to gatecrashing university (where his ‘nice’ ways went a long way with the students of Keele University) or parliament (having a chat with a politician). Sadly, he never quite understood the importance of making a living. Relying heavily on the generosity of his heart-warming mother (Gemma Jones). One thing is for certain though, he was Stoke City Football Club through and through. This passion shone through when waiting outside the ground for the entirety of a rainy, winters day just to see if there was any help that could be given to, Lou Macari, the new manager (Tony Curran). After waiting in the rain all day and revealing to Macari that he was out of work he was asked ‘How do you fancy commin to work for me?’ ‘Kitman’. Gratefully accepting the offer but being modest about it, pleasing to see, he had found a job that he would love just like that. It is hard to imagine a football manager giving a man in his circumstances that opportunity today. He got great joy from making others feel happy. At the circus, although this was his trade, it was also his livelihood, ‘making people happy you know’. His learning difficulties made employment difficult but his positivity in times of great hardship was key to his role as a servant for Stoke City football club. Taking all the banter and humour in the changing room on the chin even if was not lighthearted, being called a ‘mong’ on one occasion. He even got in on the act from time to time like when all the boxer shorts of the entire squad were missing and then revealed under Neil’s shorts. If you wonder whether Neil re-paid the faith of Macari, he did so in flying colours giving an inspired team talk every so often – ‘score more goals than the opposition’. ‘You know when asked me who my best signing was? It was you mate. No contest.’ was Macari’s frank reflection of Neil’s value to the football club’s dressing room spirit. It was not just football that Neil lived for, his church provided a great social network for him having a vicar who was always there to talk to. It was emotional to see his proud mother feel like she constantly had to watch over him like a hawk. Neil moved out of his home and ended up just a few blocks down the same road but really couldn’t manage to look after himself for too long. Soon after finding a place for himself he had spent £800 on keeping his beloved budgies warm. He had many desirable traits, not getting too down in times of hardship and not getting too upbeat when things were going well. Things were not going so well when Neil was on top of the world as the Kitman, his fragile mother was slowly but surely on her last legs. When reality hit home and she was no longer around this was the one time Neil could not control his emotions.